Deaths through famine and lack of medical attention in the country are being aggravated as UN Refugee Agency relief operations are just one per cent funded. People in war-ravaged Yemen are dying of famine and lack of medical attention in a situation now “beyond any humanitarian catastrophe,” UNHCR, the UN Refugee Agency said today, warning the crisis would likely worsen as humanitarian needs are acutely underfunded. “There is significant famine, there are people dying because of lack of medical attention, there are people who are out of schools simply because the schools are being used as shelters for displaced people,” said UNHCR’s Representative in Yemen, Ayman Gharaibeh. “We used to say last year that we were in a catastrophe. Now we’ve said that it is beyond any humanitarian catastrophe that we’ve seen,” he said, speaking on the sidelines of a news briefing at the Palais des Nations in Geneva. War reignited in the country of 27 million people in March 2015, creating a situation where fully two-thirds of the population – or some 18 million people - are now dependent on external aid in order to survive. The situation facing many of the three million people displaced from their homes in Yemen is essentially a struggle for survival – food, water and shelter are priority. Many are now enduring miserable and inadequate conditions living in overcrowded or makeshift shelters for months on end and without sufficient protection. Providing an effective response is currently being hindered by an acute funding shortfall that has left UNHCR with just one per cent of the US$99.6 million it needs to continue its vital relief operations in the year ahead, Gharaibeh said. Whereas in 2016, UNHCR spent US$76 million in its emergency response to different waves of displacement and stockpiling relief items in Yemen, Gharaibeh said it has started this year with just US$600,000 in its bank account. Having a fully funded operation “gives us the opportunity to have different options, be it for shelter, be it for cash programming,” he added. In an example of the impact the funding shortage was having, Gharaibeh said UNHCR would not be able to follow through with financial assistance to some 2,000 vulnerable widows identified as in need. “There have been assessments done in terms of vulnerability, but since that has not been matched with funding, it undermines our credibility, and the credibility of the response. The current situation has been compounded by decades of neglect, which has left weak institutions, poor government, and a feeble economy. My comment: Imagine how miserable all that is. The sum UNCHR so urgent requires for the whole year 2017 to do its work just is the equivalent of 12 hours Saudi aerial war against Yemen (around the clock, since March 26, 2015). Or: It is 1,38 % of the yearly sum for which the Saudis bought arms just from the US during Obama’s eight years of presidency. – And imagine how small the sum actually is the UNCHR requires: It’s somewhat more than US $ 5 for every person in need per year! What more than a few simple meals you could give to one person for that money – within a whole year?? The Panel of Experts on Yemen considers that, after nearly two years of conflict in Yemen, an outright military victory by any one side is no longer a realistic possibility in the near term. The country has fractured into competing power centres, with the Houthi-Saleh alliance controlling much of the northern highlands and the legitimate Government, backed by forces from Saudi Arabia and the United Arab Emirates, seeking to build capacity to administer parts of the south and the east. To date, the parties have not demonstrated sustained interest in or commitment to a political settlement or peace talks. The Panel assesses that the Houthi and Saleh forces continue to operate as part of a military alliance, while maintaining separate lines of command and control at the operational level. The Panel has identified the increased use by the Houthis of battle - winning weapons, such as anti-tank guided missiles that were not in the pre-conflict Yemeni stockpile. These missiles are covertly shipped to the Houthi-Saleh alliance over land, along a new main supply route from the border with Oman. The Houthis have also continued to use short-range ballistic missiles and free-flight rockets against Saudi Arabian towns within 300 km of the border, to some political and propaganda effect. The air campaign waged by the coalition led by Saudi Arabia, while devastating to Yemeni infrastructure and civilians, has failed to dent the political will of the Houthi-Saleh alliance to continue the conflict. Maritime attacks in the Red Sea in late 2016 have increased the risk of the conflict spreading regionally. The HouthiSaleh alliance has demonstrated that it has an effective anti-ship capability, with one successful attack against a United Arab Emirates naval ship, and other attacks eliciting a cruise missile response by the United States Navy against Houthi land radar stations. There has also been a failed improvised explosive device attack by an as yet unidentified party against a large liquid nitrogen gas tanker heading north through the Bab al-Mandab strait. Although the military front lines have remained largely the same, the nearconstant clashes and casualties notwithstanding, the political landscape has shifted. The Panel has identified a tightening of the Houthi-Saleh political alliance, culminating in the establishment of a Sana’a-based supreme political council. On 28 November, this body announced a new 42-person government. The Panel believes this to be an attempt by the alliance to create “facts on the ground” by establishing a functioning, de facto government that will be difficult to uproot. It is, in effect, a new “bureaucratic” front to the conflict. Throughout 2016, the alliance has constantly undertaken acts that are exclusively within the authority of the legitimate Government. The transfer of the Central Bank to Aden by the Government has effectively opened an “economic” front to the conflict, aimed at denying the Houthi-Saleh alliance the resources necessary to support continued hostilities or to administer the territory under its control. It has also significantly reduced the provision of material and services that are indispensable to the survival of civilians. The move may result in accelerating the impending humanitarian catastrophe in areas under the control of the alliance. All parties to the conflict have obstructed the distribution of humanitarian assistance within Yemen. The methods of obstruction vary, including the denial of movement, threats to humanitarian staff and the placing of conditions that seek to influence where and how aid is distributed. The Panel continued its investigations into the financial networks of designated individuals and has identified that Khaled Ali Abdullah Saleh has a significant role in the management of financial assets on behalf of listed individuals Ali Abdullah Saleh (YEi.003) and Ahmed Ali Abdullah Saleh (YEi.005). The Panel has identified suspicious transfers of significant funds during the period 2014-2016, involving six companies and five banks in five countries, that certainly fall well outside the normal fund management practices of high-wealth individuals. The Panel has also identified a company named Raydan Investments and accounts used by Khaled Ali Abdullah Saleh to launder $83,953,782 within a three-week period in December 2014. The financial activities, in terms of regional black market arms trafficking, of Fares Mohammed Mana’a (SOi.008) have also come to the attention of the Panel, in particular since he was appointed as minister of state in the new Sana’a -based government of 28 November and has known connections to both Ali Abdullah Saleh (YEi.003) and the Houthis. He is freely travelling on a Yemeni diplomatic passport, including within the Schengen area. This case is just one illustration of how opportunistic businesspeople and criminal entities are benefiting from the conflict using governmental privileges and immunities. It is in their vested interest to use their influence to undermine any prospect for peaceful settlement. Only the continuation and effective implementation of the targeted sanctions regime will deter such individuals and their supporters from participating in acts that threaten the peace and security of Yemen. If well implemented, delisting within the sanctions regime could offer incentives for those who are willing to engage constructively for a better Yemen. My comment: A very interesting report. As it had to be expected, it stays in the political frame of rhe Hadi government as “legitimate” (what it is not; recognition from outside cannot bestow any “legitimacy”, even not the UN can do so). Thus, such twisted phrases can show up as “Throughout 2016, the [Houthi / Saleh] alliance has constantly undertaken acts that are exclusively within the authority of the legitimate Government.” Really?? Nearly 2 years into the Saudi-led air campaign in Yemen, Houthi-Saleh forces control land where more than 80% of Yemenis lived pre-conflict. Final report of UN experts panel concludes military victory for any side in #Yemen "is no longer a realistic possibility in the near term." UN panel of experts: Houthis have received weapons including anti-tank guided missiles since start of #Yemen conflict. UN panel of experts: 2 year Saudi air campaign "devastating to Yemeni infrastructure and civilians," but not Houthi "political will." UN PoE: Move of Yemen's central bank "may result in accelerating the impending humanitarian catastrophe". UN PoE: AQAP and ISIL "exploiting... governance vacuums" in Yemen... "laying the foundation for terrorist networks that may last for years." UN PoE has Saleh family laundering more than $80 million. #Yemen. Buried in this UN report: "The Panel assesses #Yemen to be in danger of fracturing beyond the point of no return." "Instead of one large war... the conflict in #Yemen comprises several smaller wars." US deploys "small numbers" of military personnel in #Yemen to "assist in operations targeting AQAP." UN PoE assesses ISIL in #Yemen weaker than in 2015. "ISIL is struggling to maintain this early momentum... suffered a wave of defections." One of the few things in #Yemen that is now *more* affordable? Bullets. UN PoE finds Saudi air campaign reflects either "ineffective targeting process" or policy of "attrition against civilian infrastructure." Comment by Hisham Al-Omeisy: Excellent thread on UN Panel of Experts report on #Yemen. Sam does superb job tweeting highlights/excerpts with own expert commentary. As Mena defence spending tries to recover from last year’s first decline in eight years, multiple ongoing conflicts in the region are expected to keep the arms industry busy. Mena defence spending, which fell last year almost 2 per cent year-on-year because of low oil prices, is expected to rise 1.4 per cent to US$165 billion this year as countries face a number of conflicts, according to the consultancy IHS Jane’s. "Defence spending in the region is expected to rise to around $180bn by 2020 and we’ll also see this spending being heavily supported by ‘off-budget’ funds where key equipment requirements emerge," said Craig Caffrey, a senior analyst at IHS Jane’s. Some deals, particularly for the UAE, could emerge this week at the International Defence Exhibition (Idex) taking place in Abu Dhabi, where 1,235 companies will participate in the biennial event, a 3 per cent increase on 2015. There are new developments likely to spark new spending. "From a geo-strategic standpoint, Iran remains the most critical challenge for the [Arabian] Gulf states," said Aleksandar Jovovic, of the aerospace and defence consultancy Avascent. The Gulf stand-off with Iran has already led to a spike in investments in missile defence systems in the region over the past five years and is likely to continue if Iran’s defence budget swells, said Mr Caffrey. There is likely to be a shift in spending patterns owing to the nature of new conflicts. "We’ve seen the acquisition of strategic transport and tanker aircraft, intelligence-gathering platforms and precision guided munitions … which are capabilities that states within the region have not traditionally focused upon," said Mr Caffrey. "And that’s down to attempts to build the kind of capabilities required to conduct operations beyond their own borders. Until recently, military capabilities in the region have been very much focused upon territorial defence, so this transitional process will take time and significant amount of funding." Mena countries involved in conflicts are likely to prioritise spending on weapons, maintenance, repair and overhaul (MRO) of all systems and platforms, including aircraft, and land vehicles among others, said Mr Jovovic. The region also may experience an uptick in investment in naval capabilities, which are needed to protect the strategic Strait of Hormuz in the Gulf and Bab El Mandeb strait in the Red Sea. My comment: Insane. Spreading anti-Iranian paranoia = more profit from arms sales. – Nearly in every paragraph of this article you can hear that more arms especially for the Yemen war are to be bought, whether for fighting on the ground, in the air or at sea. More war in Yemen = more profit from arms sales. – Does the Trump government favor both just to “make America [the American arms industry] great again”? –More reporting and photos of IDEX: cp13a below. Earlier reporting on this arms show YPR 267 (http://www.idexuae.ae/ ). Philip Haney, a retired Department of Homeland Security officer who specialized in Islamic theology and the strategy and tactics of the global Islamic movement, said the CIA had to overlook a remarkable amount of “derogatory information” to honor a Saudi leader for fighting terrorism. “Since 9/11, the terms of our relationship with Saudi Arabia have been defined by the Saudis, not by the U.S.,” Haney told WND. “To gain Saudi support in the ‘War on Terror,’ one of the first post-9/11 compromises America made with the Saudis was to redact the now-infamous ’28 pages’ from the 9/11 Commission Report, thus shielding and/or exonerating them from any involvement or responsibility. “A second compromise we made with our Wahhabi partners in peace was to ignore their decades-long role in the funding and support of thousands of pro-jihad madrassas throughout the Eastern Hemisphere. Trump and Pompeo [Trump’s new CIA director] appear to be continuing the long tradition of treating Saudi Arabia as an ally despite its past associations with terrorism. “The one-sided quid pro quo alliance between America and Saudi Arabia is remarkably similar to the ‘gentlemen’s agreement’ between Turkey and Europe, and the West, to overlook the Armenian genocide for the sake of peace and political and economic stability,” Haney said. Haney, co-author of the book “See Something, Say Nothing: A Homeland Security Officer Exposes the Government’s Submission to Jihad,” noted the Saudis exercise tremendous influence over the American government. Haney said he can think of several possible reasons why Pompeo would give a Saudi prince an anti-terrorism medal. It may have been intended to signal to Iran that the U.S. is openly siding with the Sunni Islamic world. Or maybe it was an acknowledgement of the Saudi-led coalition in the ongoing war in Yemen, which began in March 2015 with U.S.-supported air strikes. Or maybe it was a gesture of thanks for Saudi Arabia’s ground-support role in Syria after Obama authorized the CIA to begin secretly arming Syrian rebels in 2013. Here, however, things get complicated, because a year later Saudi Arabia designated two of the opposition groups the CIA was initially supporting in Syria as terrorist organizations. Murray, author of “Utopian Road to Hell: Enslaving America and the World with Central Planning,” pointed out virtually all Islamic terror is Sunni, with Hezbollah being the only Shia terror group. But Murray said Hezbollah is not in the same league as other Muslim terror groups because Hezbollah attacks military, not civilian, targets and operates hospitals in Lebanon. Murray places the blame for this award squarely on Pompeo. “I don’t think President Trump ordered Pompeo to go to Saudi Arabia,” Murray said. “I do not believe that President Trump was aware that Pompeo was going to give Prince Abdulaziz this prestigious CIA medal. Rather, I believe that CIA Director Pompeo has been in the pocket of the Saudi royal family since his time on the Permanent Select Committee on Intelligence in the House. It was his duty to oversee the CIA and now he runs it. Conference: Is Yemen the First Battleground in the Trump Administration’s Confrontation with Iran? President Donald J. Trump’s administration and U.S. partners in the region – in particular, Saudi Arabia – see Yemen as an important arena in which to confront Iran’s destabilizing behavior, and to neutralize the threat it is seen as posing to Gulf Arab states. But this confrontational approach carries the risk of triggering Iranian retaliation, or even an armed conflict involving Iran, the United States, and the United States’ regional partners. What role is the United States playing in the conflict in Yemen and is its support for the Saudi-led intervention likely to increase? Is Iran challenging the Trump administration’s resolve by testing ballistic missiles and applauding attacks by Houthi rebels on Saudi targets? Will the Joint Comprehensive Plan of Action survive the increased tensions and do the parties involved have the space or the inclination to de-escalate current tensions? Join AGSIW for a discussion of these issues and other challenges facing the Trump administration and U.S. partners in the Gulf as they push back against growing Iranian influence in the region. Check back on February 23 to watch live. Comment by Judith Brown: Well - I guess their intelligence is still haywire. WMD in Iraq. Iran in Yemen. I could do a better job than the US intelligence agencies. And in any case, unless I've got this wrong - name me one country that Iran has invaded and bombed incessantly from the air? Maybe this is Iran's mistake. It hasn't learned that to save people you gave to bomb them their homes, their hospitals,their schools, their ports, their farms, their roads, their bridges - just like USA and U.K. do. A Saudi-led coalition is working with the Yemeni military in an effort to clear thousands of landmines believed to have been planted by Houthi militias and forces loyal to deposed Yemen President Ali Abdullah Salah, the Saudi Arabian Embassy in Washington reported recently. The landmines, which the embassy said have claimed many lives and prevented Yemeni citizens from returning to their homes, are intended to stop the advance of pro-government forces. Hussein Awadi, the former governor of Yemen's Al-Jawf Governorate, said he believes the Houthi militias and their allies had planted more than 30,0000 mines of various sizes in the governorate. My comment: The saudis should stop dropping cluster bombs as well. Her face horribly burned and body pitted with shrapnel, Eman’s hands have had to be tethered to prevent her from scratching at her sickening wounds. The one-year-old’s eyes are closed, one is badly bruised while a tube and monitors are dotted round her broken, bandaged body as she lays in the emergency ward of a hospital in Yemen’s capital Sana’a. Her stomach has been punctured by flying debris. In a bed across the ward, one-year-old Zuhoor, her eyes puffed and red from bruising and right arm in plaster is an equally shocking sight, lying in a yellow top dotted with cartoon characters and her own blood. Both children were among the innocent victims of an airstrike by warplanes of the Saudi-led coalition which struck a house north of Sana’a where a crowd of mourners had gathered on Wednesday night. Seven women, among them Eman’s mother, and a child are said to have died in what was being described as the ‘latest outrage’ of the coalition’s controversial bombing campaign. Dozens were reported to have been injured, including Eman and Zuhoor, as residents in the village of Ashira pulled them from the wreckage of collapsed buildings. The airstrike hit the house of a local tribal leader where mourners were gathering to offer condolences after the death of a well-known local woman. Pictures published by local media showed tribesmen searching through the rubble of a destroyed house said to belong to Mohammed al-Nakaya, a tribal leader allied with Yemen's Houthi movement. He said : 'We’ve heard at least one child was killed, and our teams have just visited a hospital where they saw two infants who had been seriously injured, including a one-year-old girl with shrapnel wounds to her stomach and burns right across her face. My comment: Broad reporting on this air raid YPR 268. – But in this article here, no word on the fact that these kids’ faces are Britain looking into the mirror of its own foreign policy backing Saudi air raids and selling them arms to do so. My comment: This figure clearly shows how eager the Saudis and the US defend the security of shipping in the Red sea. Yemeni government troops and Houthi rebels have been engaged in fierce battles in and around a coastal town seen as a major smuggling point for arms used to supply rebels. In recent days, both sides have won and lost territory near the port of Mokha in what analysts and Yemen officials see as a make-or-break fight to sever a rebel supply line. Saudi and U.S.-backed government forces are convinced that Houthis rely on Iranian smuggled arms coming through maritime ports along the western shores of Yemen. “By taking Mokha, we deprive Houthis from the source where 40 to 50 percent of their smuggled arms are coming from,” Ahmed Saif Al Yafei, a Yemeni army commander, told VOA. Iranian officials say they are not involved in supplying weapons to Houthis — despite credible evidence, Yemeni and U.S. officials say, that in recent months Iran has been violating a U.N. embargo prohibiting the transfer of arms to Houthis. Mohsen Rezaei, Iran’s Expediency Discernment Council secretary, said in early February that Houthis receive missiles and ammunition from Russia. Tehran’s support to Houthis, he said, is limited to spiritual guidance and sympathy. And Houthis say they already have weapons and that the U.S.-backed monitoring efforts on the Red Sea have virtually shut down weapons smuggling. “We don’t need to smuggle weapons. We defeat them and get theirs. We control several weapon stockpiles, too,” said Aziz Hussein, the deputy spokesperson of the Houthi and Saleh forces. The fight to control Mokha has intensified over the past couple of weeks. All warring factions are claiming victory in Mokha, including government forces loyal to President Abdu Rabu Mansour Hadi, Houthis and their ally of loyalists to former President Ali Abdullah Saleh. Meanwhile, government forces claim full control over the Dhubab port on the southwestern coast of Yemen. Now they are aiming at reaching Hodeida port, one of the main and strategic harbors in the country. My comment: An idea for peace in Yemen. I disagree that the US should be the main peace broker; they have disqualified for such a role, especially in Yemen, since a very long time. Take the UN and neutral states like Oman, Switzerland, Algeria, Uruguay. – Why Hadi-aligned forces should return to Sanaa? That’s still a rest of the outdated pro-Hadi pro-Saudi UN resolution 2216. Sanaa only can become a neutral city open to all parties of the country, controlled not by any party alone. Algerian blue helmets would do much better. US $ 15 as estimate for the sum required to rebuild the country is a joke, spread by the Saudis to keep the idea of damages in Yemen low. Take at least 10 times more, as more realistic estimates require. Yes, the Saudis should pay for all that. My comment: “Suspected Saudi airstrike”: Typical western propaganda wording. This air strike is not “suspected”. They even found the bombs’ fragments at the site. Ful reporting on this raid YPR 268, cp1a. It has been six years since protesters took to the street across the Arab world, demanding human dignity and political and economic rights. Since then, only Tunisia has made a relatively successful transition into representative democracy. It would be a mistake, however, to assume that the impetus behind the Arab Spring has been buried by counter-revolutionary forces and the reemergence of Arab autocrats. Instead, as a recent report from the United Nations Development Programme (UNDP) reveals, the core issues that led to the uprisings remain unresolved. Comment: Nothing close to a spring: all the countries saw the dreams of the youth being stolen by the usual bunch of those who claim 'order' and 'democracy'. In #Yemen a Coalition of 9 countries backed by US/UK intelligence and skyrocketting arms sales from 'democracies' turnt the country into an aggression field still raging on. If only they let people, the common ones, choose for themselves. We are in Yemen's ground with Comitato Nour fighting Cholera disease's source in the capital of Yemen, Sana'a, through distributing chlorine tablets for families. photos of today project that aimed to support 250 families with chlorine tablets in Bani AlHareth district, the capital of Sana'a. The families we have helped don't have completely access to clear water. My comment: there is still much to be done in this country after the war. Der Jemen hat seit Jahren mit Hungersnöten zu kämpfen. Das Land muss einen Großteil der Nahrunsmittel importieren, da es größtenteils aus Wüste besteht. Nun hat der Krieg die bestehenden Probleme weiter zugespitzt: Den Einwohnern droht eine riesige Hungerkatastrophe. Mehr als 18 Millionen Menschen sind davon betroffen. Etwa 10 Millionen bräuchten sofortige Hilfe, um ihr Überleben zu sichern. Verschiedene Hilfsorganisationen sind im Jemen tätig und unterstützen dort seit Jahren die Bewohner. Thousands of families from Yemen’s port city of Mocha and its outskirts have been displaced by recent fighting between pro-government forces and the Shia Houthi militia, according to a local activist. "More than 3,000 families from Mocha now face poverty, hunger and disease," Ahmed Mokaiber, a Mocha-based activist and journalist, told Anadolu Agency on Friday. "They are living in extremely difficult circumstances," he said. "The ongoing conflict has only aggravated their suffering." Most basic services in the port city, he added, including the local telephone network, had been rendered inoperable by the recent fighting. "Residents remain cut off from the outside world," Mokaiber lamented. "The war has prevented many people from returning to their villages." He called on the Yemeni government and international aid organizations to send urgent humanitarian relief to help Mocha’s struggling civilian population. The Food and Agriculture Organization of the United Nations (FAO) confirmed on Friday that it is unacceptable in the 21st century to be 20 million people at risk of starvation in various parts of the world. FAO director at the Emergency and Rehabilitation Division Dominique Bargeon called on the international community to find solutions for the armed conflicts in some countries through political means to enable the United Nations agencies and relief organizations to do their function safely and delivery of humanitarian aid urgently. Bargeon said in remarks carried out by Belgian's state media on Friday that there are four areas in the world currently suffering from hunger, such as Yemen, South Sudan, Nigeria and Somalia. "There are 20 million people suffering from severe food shortages in these areas and we are afraid of their lives of starvation in the upcoming six months", he said. The UN official described the situation in those four countries as "tragic", stressing that the population does not have access to basic food, and sometimes forced to sell their property and their livestock for food. He said that the FAO is very concerned about this situation, pointing out that this situation is the worst in 20 years. Despite all of this, you probably won't have heard much about it, because Yemen is rarely reported on. Mostly this is due to insecurity and the country's limited access for the media; but because of this it remains a largely 'hidden crisis'. Meaning that, while people are rushing to donate to help children in Syria, the children of Yemen are going largely unnoticed. The international response to the crisis is far from adequate, both in terms of funding - the UN's $1.8 billion response plan is only 12 percent funded - and for coming up with a solution for the political unrest and to end the conflict. The UN has recently launched a new push for $2.1 billion. Amongst all this mess Save the Children is stepping in to help children who are in danger - with just under half of Yemen's population aged under 18, this is a pretty massive task. Zuhair* was just 13-years-old when he and his stepdad Waleed* were almost killed late last year in an airstrike on a funeral that killed 140 people. However, they didn't escape unscathed; both received burns in the attack, with Zuhair suffering from third degree burns to many parts of his body as his clothes caught alight. Waleed tells his heart-breaking story: "The hall was full of mourners. Suddenly, there was an unimaginably loud blast followed by a dazzling flash and a firestorm. I found Zuhair and carried him out of the hall. Both our clothes were on fire and burning our skin. Zuhair and I saw dozens of burned bodies and body parts - half bodies, heads, hands, legs, etc. Seconds later, we heard another airstrike, then a third one. They targeted the two entrance gates and the centre of the hall. I ran out to the main street for safety. We were lucky to escape with our lives. Many didn't. "It was evening when we reached our home. My wife panicked when she saw our burned and swollen bodies. Our pain was unbearable, and we did not know what to do. Zuhair had burns on his hands, thighs, knees, legs and feet. We thought they were superficial burns and did not know what to do, unable to afford to take him to hospital. So we applied toothpaste, tomato paste, honey, herbs and some ointments on them for about a fortnight. During that period, Zuhair got very thin and weak, could not walk and screamed very loudly every day because of the pain." Luckily for Zuhair, help arrived in the form of Save the Children, when Zuhair's case was picked up via Save the Children's Child Protection Committee: a group of community members trained to identify children in need and report them to Save the Children's Child Protection staff. They were able to intervene to ensure that he got the specialist treatment he needed, and they continue to help him to this day. Waleed continued: "When they saw Zuhair, they immediately referred him to a local hospital where his wounds were cleaned and treated. Although Zuhair's physical condition has improved, he remains under a severe shock. He now suffers from recurrent nightmares and wakes up screaming most nights. 'Mum, the missile is going to hit us. The missile is going to kill us'. "When he hears a Saudi-led Coalition aircraft overhead, he runs to his mother and asks her to switch off the mobile phone because he thinks the aircraft can target his family through a SIM card," Waleed said. "Zuhair still goes to school; he is in the third grade. However, his character has changed a lot - now he is uninterested, introverted, unsociable and fearful. I really hope that Zuhair improves and gets back to his normal psychological condition. I also want this war to end. We have suffered enough. The children are scared and hungry. My comment: A sad story of this boy… – One thing is wrong: There is not just little reporting on Yemen “due to insecurity and the country's limited access for the media”: There is access, there is enough treporting from within the country. But the Yemen war does not fit well into the Western mainstream “transatlantic” propaganda bias: The US are the “good guys”, there politics is the right one, and the crimes of their allies are just not reported. Million thanks to @monarelief's ground crew in #Yemen who always putting their lives at risk just to help ppl. Mohammed, Saddam and Saif. My comment: MONA relief is doing such a great work all the time – what sort of ignorant idiots did jail them for doing that??? Former President and head of the General People Congress (GPC) Ali Abdullah Saleh said the aggression on Yemen is financed by Saudi and Gulf money and backed by the US, Britain and Israel. In a speech delivered on Saturday night, Saleh said the so called "decisive storm" has achieved nothing but more bloodshed, destruction and attempts to starve and kill 27 million Yemenis through the unjust all-out blockade, imposed by Saudi Arabia and its allies. "The aggression on Yemen has been committed under the eyes and ears of the whole world for two years, particularly the United Nations," Saleh said. "The UN silence and blessing make it a complicit partner in war crimes committed on a daily basis by Saudi Arabia and its coalition," Saleh concluded. The event consisted of chants and spirited slogans, a number of speeches and a show held by the Ansarullah band. The statement of the marching given by the president of the Martyrs Foundation, Hussein Al-Qadhi, welcomed Sayyed Abdulmalik’s call on the importance of documenting the martyrs and taking care of their families. He also confirmed his foundation’s total support for the families of the martyrs, calling upon the government to implement projects for the families’ service in recognition of their resilience. As one of hundreds during the march for the martyrs, he stressed on the importance of unity and standing as one confronting the Saudi American aggression in a way to respect and appreciate the sacrifices of the martyrs. My comment: ?? That’s the Saudis and their US, UK etc. arms suppliers who must take responsibility. My comment: The Hadi government still not had paid state employees at Aden proper. It seems all announcements just have been propaganda up to now? Governor of Aden Aidroos al-Zabedi has said that there are a lot of challenges which the port city of Aden faces, pointing out that the main challenge is counter-terrorism and naturalization of life. "We succeeded to a large extent in fighting terrorism and are still need to be supported in order to eradicate it" he added. He also emphasized that Aden lack to essential services such as electricity, water, judiciary and others. The Yemeni government had stated that it prepares a plan to eliminate al-Qaeda in the Arabian Peninsula from the governorate of Abyan. My comment: By Islah Party media. Yes, there are many challenges for Aden, terrorism being a very great one. Look at the article, the headline does not fit to the text. And this headline is odd propaganda only, as often stated before. – And the determined wording of the Hadi government to fight Al Qaida is quite the opposite to its opportunities. Yemen's Interior Ministry has called Interpol to resume its activities in liberated areas of Yemen. This call came during a meeting held in Jordon between Yemen's deputy interior minister Ahmed al-Musai and Director of the Interpol's Middle East and North Africa regional office Abdulaziz Obaidallah. A local source in Ataq city of Shabwa governorate, southeastern Yemen, said that four persons were killed on Thursday in mysterious circumstances northern the city by unknown gunmen. The source told Almasdaronline that the locals found four dead bodies for the office director of the Passport Authority Chairman in Shabwa governorate, and three other people. The source added that the gunmen have not been recognized, pointing out that they were likely al Qaeda elements. Minister of Foreign Affairs, Hisham Sharaf, expressed Saturday his surprise at remarks made by some ambassadors of friendly countries, calling them to instead seek the interest of the Yemeni people and help establish peace in the region. In a statement to Saba, the minister said that some of these countries only seek to serve the objectives and interests of their own, but not the interests of the Yemeni people. He Said those countries, or the so called Quarter countries, don't take into account the objective of restoring security, peace and stability in Yemen, or solving the problem of millions of homeless displaced by the Saudi aggression and rebuild what has been destroyed by the Saudi aggression air attacks, including facilities, public and private buildings. He said that the Republic of Yemen has asked the United Nations to add Russia into the Quarter countries's group as a neutral party. My comment: “Friendly countries” (that’s misleading!) and “Quarter countries” are USA, UK, Saudi Arabia and the Emirates; representatives of these countries had met several times to play “peace brokers” for Yemen although they all together are warring parties. Thus, this request by the Sanaa foreign minister really was to be expected. Complications restructuring Saudi Arabia’s state-owned oil company and disentangling its finances from those of the government are slowing the march toward what is expected to be the biggest initial public offering in history. The hotly anticipated listing of a minority stake in Saudi Arabian Oil Co., the kingdom’s corporate crown jewel, is now unlikely to happen until late 2018 at the earliest, and if foreign advisers have their way, won’t happen until 2019, according to more than a half-dozen people involved in the process. The country’s deputy crown prince first said early last year that the initial public offering would happen in 2017 or 2018. More recently, Saudi officials have said 2018 will be the year. The difficulty of quickly turning a behemoth that functions largely to support the Saudi budget into a company accountable to shareholders has crystallized over the past couple of months. In this documentary, the possibility of achieving more equality between men and women in Saudi Arabia is discussed. Female shop owners, politicians and employees talk about the hostility of men when it comes to taking a stand in public life. A sports teacher talks about the problems of girls and women to exercise in public. A chief editor talks about possible freedom of press. In a family, the new phenomena of single life or divorce are being discussed, as well as the role of women in western societies compared to traditional Arab societies. Female artists and photographers discuss censorship in exhibitions. With shrinking oil reserves and more economic restraints, the government is pondering reforms in society. A young lawyer works to adjust rigid Islamic law to modern life. Saudi-Arabien hat in den letzten Monaten tausende pakistanische Arbeiter unter dem Verdacht des Terrorismus ausgewiesen. Eine Mauer an der irakischen Grenze soll die Golfmonarchie nun vor den eigenen wahhabitischen Gesinnungsbrüdern schützen. Die Massenabschiebung rund 40.000 pakistanischer Arbeiter in den letzten vier Monaten, von denen viele in Verbindung mit der Terrormiliz "Islamischer Staat" stehen sollen, wirft auf dem internationalen Parkett einmal mehr ein beschämendes Licht auf Pakistan. Das Land fühlt sich auch selbst zunehmend isoliert und sieht sich selbst als ohnmächtig dem Terror gegenüber. Nach außen hin macht Pakistan die Nähe zu Afghanistan für den Terror im eigenen Land verantwortlich und weist seinerseits massenhaft Afghanen aus. Aber es sind nicht zuletzt unzählige illegale religiöse Kaderschmieden, die quer über das eigene Land verstreut sind, in denen Prediger Schülern ein Leben für den Gotteskrieg einimpfen. Denjenigen abgeschobenen Arbeitern, die keine Verbindungen zum Terror haben, wirft die saudische Regierung kriminelle Delikte wie Drogenschmuggel, Diebstahl, Körperverletzung und Dokumentenfälschung vor. Für Pakistaner ist Saudi-Arabien der größte Arbeitsmarkt außerhalb ihrer Landesgrenzen. Saudi-Arabien war eines der letzten Länder, welches die Sklaverei offiziell im Jahr 1974 abgeschafft hat. Die Gastarbeiter aus den asiatischen Ländern Pakistan, Indien, Sri Lanka, Bangladesch, Philippinen und Indonesien werden als "Miskeen" bezeichnet, was soviel wie arme Schlucker bedeutet. Ein deklassifizierender Ausdruck, der sie zu Menschen zweiter Klasse macht und das Leben am Rande der Gesellschaft Saudi-Arabiens kennzeichnet. Heute steht das Land im internationalen Vergleich an dritter Stelle mit 10,4 Millionen ausländischen Arbeitern, bei einer Bevölkerungszahl von 30,8 Millionen im Jahre 2016. Auch Saudi-Arabien hat die Abschottung nach dem Vorbild Trumps für sich entdeckt. Grenzzäune sollen künftig die Auswirkungen des Chaos im Irak von der Golfmonarchie fernhalten. Und so bauen die als arme Schlucker Bezeichneten diese Befestigung für ihre Herren an der Grenze zum Nachbarland. Insgesamt 40 Wachttürme und zwei einander gegenüberstehende Zäune werden mit modernster Überwachungstechnik ausgestattet. Es gilt die 814 Kilometer lange Grenze gegen IS-Terroristen abzuschirmen. Denn so sehr Saudi-Arabien und den IS die gemeinsame Liebe zum Wahhabismus verbindet, bedeutet der "Islamische Staat" eine Gefahr für das Königshaus Saudi-Arabiens. Den Zuschlag für den Bau des ersten Grenzzaunes erhielt 2009 die Airbus-Gruppe. Secretary of State Rex Tillerson’s plea for “humanitarian assistance throughout Yemen” must be followed with robust action by the U.S. and its allies. There is a severe risk of famine in the impoverished Middle Eastern nation. The United States and other donor nations must increase their food aid to Yemen. To put Yemen’s crisis in perspective, more than two-thirds of Yemen’s population is living in hunger. It’s critical we stop the famine. We cannot achieve peace in Yemen or anywhere in the globe where there is hunger. Nigeria, Somalia, South Sudan, and Yemen face the most severe risk of famine. There is also the continuing hunger tragedies caused by the wars in Syria and Iraq. Drought has struck other nations including Ethiopia and Madagascar. To deal with this crisis the Congress will have to provide extra funding to our aid programs including Food for Peace, Feed the Future and the McGovern-Dole international school lunch program. Like we did after World War II to prevent famine, the United States will have to step up its hunger relief efforts. Food has again become top priority for our foreign policy. Yemen is where the food is needed most urgently. Remember this: small children suffer lasting physical and mental damage from the lack of food. Or they may perish from starvation. My comment: Lambers is absolutely right. But food actually never had not been the interest of US foreign policy: it always was bombs instead of bread, fighter jets instead of food. Two of U.S. President Donald Trump's sons arrived in the United Arab Emirates for an invitation-only ceremony Saturday to formally open the Trump International Golf Club in Dubai. The visit to Dubai, the first joint business trip abroad by Eric and Donald Trump Jr. since their father's inauguration, comes as questions still swirl about how the Trump Organization's many international business interests will affect the administration of America's 45th president. Photographs shared on social media by real estate brokers showed Eric and Donald Jr. first attending a private luncheon Saturday afternoon in Dubai with Hussain Sajwani, the billionaire who runs DAMAC Properties, the developer that partnered with Trump on the golf course. The golf course sits inside a larger villa and apartment building project called DAMAC Hills on the outskirts of Dubai. Some 100 Trump-branded villas also are on the property, selling from 5 million dirhams ($1.3 million) to over 15 million dirhams ($4 million). My comment: Almost incredible. Does anybody really think this president will make a foreign policy which is not influenced by his private businesses?? CTV video shows Yemeni man, Sudanese family illegally crossing into Quebec from U.S.
As a growing wave of asylum seekers brave frigid temperatures to illegally enter Canada, CTV Montreal positioned itself on the American side of the border that divides New York State and the province of Quebec. There, early Friday morning in the small border town of Champlain, N.Y., the crew met a young Yemeni man who identified himself as Abdullah. “It’s so cold,” he told CTV Montreal as he trudged north through snow and ice on picturesque Roxham Road, wearing only a hoodie, light jacket, jogging pants and running shoes. Travelling alone and carrying a small backpack, he said he had been walking for nearly half an hour. If you’re outraged over Russia’s role in Syria, you should be outraged over our role in Yemen. For the almost two years since the war began, the U.S. has been a vital ally to Saudi forces. Like many of our conflicts over the decades, it’s mostly a proxy war we’re fighting here. Most of our influence in this conflict isn’t direct exactly, but we are certainly a party to this destruction. We have been providing intelligence to Saudi Arabia, we’ve been refueling their planes, and most significantly, we’ve been selling them weapons. Lots and lots of weapons. Cluster bombs consist of large canisters which spin open in mid-air and rapidly disperse hundreds of small bomblets throughout an area. The bomblets are typically scattered for hundreds of yards and can leave unexploded ordnance (UXO) behind. These tools of death—as yet unfulfilled, often come in the form of little metal spheres about the size of a baseball. 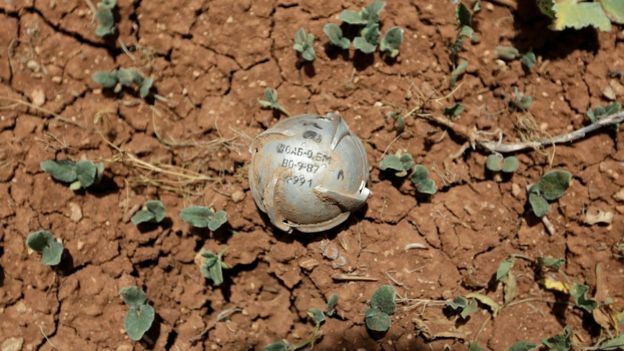 They look like toys, which is why 40% of cluster bomb victims are children. The United States blanketed Laos with over 270 million bomblets during the Vietnam War, and there have been around 50,000 civilians killed or maimed by unexploded ordnance there since 1964. 20,000 of those casualties occurred after the bombing ended. There are still an estimated 80 million unexploded bomblets in Laos. Relations between the U.S. and Saudi Arabia became strained following the Iran nuclear deal, and we rely on their intelligence and assistance in combating terror cells abroad. So it stands to reason that our support is more of an attempt to repair an important relationship then it is a show of overwhelming support for the Saudi cause. Of course, our reasons are entirely irrelevant. We are supporting this war. We are profiting off the destruction of a country. We are complicit in what many would call outright war crimes. We have made billions off of shoddy military procedures that have resulted in thousands of civilian deaths and have left millions homeless. This is one of the largest current humanitarian crises, and the United States is adding literal fuel to the fire on one side while (potentially) offering no refuge on the other. Many Americans have been up in arms over Russia’s involvement in Syria and the catastrophic destruction of that war. This is entirely warranted and vital, and it needs to continue—but the war in Yemen cannot be forgotten. Unfortunately, forgetting is common practice in the United States. We’re a nation stitched to flavor-of-the-week outrage. A few heartbreaking photos, some mainstream coverage and we’re in! Needles crack off outrage meters as inaudible snaps reverberate in zeros and ones through through social media. We’ll probably forget about the whole thing a few weeks later, but for a minute there—empathy rules the day. It’s our signature, American brand of narrow and convenient empathy. It’s a force that has little regard for equivalency or research or self-reflection. My comment: The author is right on Yemen, but quite wrong on Syria. Russia just stepped into this war several years after it had begun. Syria already was destroyed in great parts the day the first Russian aircraft dropped its first bomb there. The US and their allies did and do exactly the same there – for years now. All the destructions Russia committed in the time to follow are the consequences of the failed US policy of regime change in Syria to oust president Assad, by fueling civil war, by supporting and arming rebels who actually were jihadists and Al Qaida terrorists. Details about the crash are still unclear. Reports from Yemeni news service Saba cites a military source claiming the drone of "Saudi American aggression" was shot down by Houthi air defenses. Another report from the Turkish Anadolu Agency repeats these claims. GILGAMESH equipment acts in a similar way to Stingray devices commonly used by police forces around the world to track targets by latching on to their cell phones. Attached to the underside of a drone's wing, the GILGAMESH simulated cell tower forces cell phones to connect to it, subsequently allowing GILGAMESH to geolocate the targets via SIM card (IMSI) or device (IMEI). Remark: Earlier reporting YPR 267, cp17b; YPR 268, cp2. Shock evidence shows the RAF trained Saudi Arabia's air force how to use Paveway IV missiles produced in Scotland. The UK trained an air force at the centre of war crime allegations in Yemen how to carry out airstrikes with smart bombs. Evidence submitted during a legal case into UK arms sales to Saudi Arabia reveals the RAF trained the country’s air force how to use Paveway IV missiles. The documents also reveal that only a “very, very small” number of airstrikes were tracked and the UK knew little about the Saudis’ targeting practices. Despite being kept in the dark over airstrikes, the UK Government claimed last year that no war crimes had been committed by the Saudis. Die Bundesakademie für Sicherheitspolitik (BAKS), eine ressortübergreifende Weiterbildungsstätte der Bundesrepublik Deutschland auf dem Gebiet der Sicherheitspolitik, lässt sich aber in ihrer Beurteilung der saudischen „Aktivitäten“ im Jemen von solchen Zahlen nicht beeindrucken. Recent events off the coast of Yemen and an uptick in militant activity, including a suicide attack against a Saudi vessel last month, are expected to dominate discussions at this year's NAVDEX in Abu Dhabi. Navies that operate in the region, particularly around the Gulf of Aden and the Bab al Mandeb strait, will be particularly keen to refresh training and procedures as well as see what industry has on offer when it comes to upgrading ship defensive capabilities. Big industry players will undoubtedly use NAVDEX as a shop window for its wares, especially those companies that specialise in detection using naval radar, electro-optic surveillance technologies, countermeasures and kinetic weapons such as cannons and missiles. Over the last year Iranian-backed Houthi rebels have used their strategic position on the western coast of Yemen to launch several attacks on naval vessels, with at least two being successful. In the firing line have been ships that are aligned to the Saudi-led coalition fighting against the militant group. 'The Yemeni conflict has significantly increased the risk to all types of vessels transiting the Red Sea and Bab al Mandeb, as much of the fighting has centred on Yemen's west coast where Houthi militants have controlled a number of strategic port towns,' said analysis by the maritime security specialists Protection Vessels International (PVI). According to Michael Stephens, a research fellow for Middle East studies at the Royal United Services Institute, there will always be a 'latent low-level' terrorist threat in the region that will require naval expenditure. 'The Yemen conflict has brought into focus developments in the naval area, particularly around the threats in the Bab al Mandeb off the coast of Yemen, which were reflected of course in a Saudi frigate being targeted,' he said. My comment: As admitted, there is no actual threat to commercial ships off the Yemeni coast. All the propaganda of the need to secure international shipping there (by military means) is void. – More reports on IDEX cp1. Recent attacks on shipping off the coast of Yemen have provided both regional and extra-regional naval forces with a timely reminder that instability and insurrection on shore can all too easily extend its malign effects into the maritime sphere. What is now very clear is that the anti-ship missile threat is increasingly transcending definitions of conventional and asymmetric warfare. Proliferation to proxies and non-state actors has become a reality, evidenced by the attack on Swift. Also apparent is the continuing threat from fast inshore attack craft and/or suicide boats. Multiple swarm craft approaching along different axes pose a major challenge to shipboard defences. Against this backdrop, manufacturers exhibiting at IDEX and NAVDEX will be looking to promote the operational benefits offered by the latest generation of ship defence systems. My comment: See comment above. UNHCR and partners distributed cash assistance to 798 households to support their (re)integration. #IslamicState Claims Mortar Shelling On #Houthis Positions In #Qaifa, #Bayda. Der jemenitische UN-Botschafter Khaled Al Yamani behauptet im Schreiben an António Guterres, dass der Iran die internationale Schifffahrt durch den Bab al-Mandab störe und den Huthi helfe, vorbeifahrende Schiffe anzugreifen. Teheran bestreitet das. Mein Kommentar: „Jemen“ = Hadi-regierung. Auf Englisch wurde das schon vor längerem berichtet. Die Houthis mögen alles mögliche sein, eine Terrorgruppe sind sie sicher nicht. Würde man den Terroristen-begriff aber tatsächlich so weit fassen wollen, dann müsste man viele andere auch zu Terroristen erklären: die saudische Regierung und Luftwaffe (allemal), die US-Regierung, die CIA (hätte es auch redlich verdient) u. a. m. Ansonsten: Dümmliche Propaganda. Many Yemeni citizens are aware that some international organisations head to the country with political agendas. Often these aims make life more miserable for Yemenis, particu­larly when the organisations buy the discourse of armed groups that are guilty of the worst crimes against human rights in the country. By their behaviour, such or­ganisations, unfortunately, give a concrete example of how to betray the principles of neutrality and independence in humanitar­ian work. My comment: A really disgusting propaganda article not just repeating the well-known old/odd propaganda, but now even blaming Oxfam and MP Mitchell. Minister of the Foreign Affairs of Saudi Arabia Adel bin Ahmed Jubeir said Sunday that the Yemeni crisis could be resolved over the course of 2017. "I believe that 2017 will be a year when a number of challenges in the Middle East will be resolved. I believe that the crisis in Yemen will be brought to an end in 2017 and we see that an attempt to overthrow the legitimate government would have failed and Yemen will be on the path of economic development and reconstruction," Jubeir said at the Munich Security Conference. In its upcoming session on February 23, the United Nations Security Council will be extending, until further notice, the service of the committee of experts put together by Security Council resolution 2140 for Yemen. The committee is known to have shed light on extreme violations committed by coup militias in Yemen. A recently released report issued by U.N. experts on the situation in Yemen revealed that Iran-backed Houthi militants have staged violations ranging from corruption to torture. Not only did the report expose the steep financial corruption within the insurgency, but it also said that coup militias violated the humanitarian international law during the ongoing conflict in Yemen. Houthis resort to torture against those who oppose them and they strictly control intelligence and security institutions, the report said, adding that ousted president Saleh controls a network of tribal, political and military allies and that the Houthis have a military, political wing and decisions are still made by Abdul-Malik al-Houthi. The report added that rebels fund their battles through shadow economy like drug trade, smuggling and black market sales. The report also accused the Houthis of targeting Saudi cities with missiles and rockets. More so, U.N. experts have urged that sanctions imposed on names enlisted for violations continue, so that insurgency crimes in Yemen do not go unpunished. My comment: This is how Saudi propaganda works. Great parts of the report deal with the Saudi aerial war and various violations by Saudi Arabia, its allies, Hadi affiliates. Or they refute Saudi propaganda as the great scale arming of the Houthis by Iran. It’s just not worth mentioning. Tribes of al-Maraqishah in Abyan have accused ousted President Ali Abdullah Saleh and the Houthis of supporting terrorist groups with the aim of taking it over. Tribal leaders on Saturday held a meeting in which they stressed that they would fight terrorists and drive them out of their areas. They affirmed that their areas will be secure, emphasizing that they will not accept any existence of armed groups in their areas. The tribes warned against sheltering any outlaws, pointing out that terrorists coordinate with Saleh and the Houthis to destabilize Abyan and plunge it into chaos. My comment: By Islah Party media. Houthis and terrorist groups in Yemen are the greatest foes; the objections are void, even if often repeated. Abyan province really is menaced by terrorism and in parts has been taken over by terrorists, but it’s Al Qaida (AQAP) active in Abyan province. And as everywhere where AQAP operates with greater success, in many ways tribes and tribal chiefs are affiliated to AQAP in the one or the other way – Abyan being no exception. Thus, the whole article is quite a joke. My comment: By Islah Party media. A governor appointed by the Hadi government, almost without any part of his “province”. That article sounds quite “post-truth”, he had claimed this already sometimes ago, without any proof and further information. This seems to be the same story again. Yemeni President Abdu Rabbo Mansur Hadi lauded the United States new administration, particularly on its active interventionism against Iran’s systematic interference in region-wide affairs. Hadi’s remarks followed a meeting with the U.S. Ambassador to Yemen Mathew Taller, the president stated that that the U.S. stance is compatible with Yemeni views, in fighting terrorism and attempting to put an end to Iran’s expansionist ambitions. Iran has been backing a local armed coup ripping Yemen apart, manned by loyalists supporting ousted Yemeni President Ali Abdullah Saleh and Tehran-aligned Houthi militias. Houthis have been seeking to topple the constitutionally elected and internationally backed government in Yemen led by President Hadi. For his part, the U.S. envoy reiterated his government’s stance on backing the internationally recognized Hadi-led government in Yemen, and assisting with the realization of a peace solution. The envoy also relayed U.S. desire towards surmounting challenges and difficulties, pointing to an interest in consolidating bilateral relations with Yemen, in order to fortify counterterrorism efforts against extremist forces targeting Yemeni security and stability. My comment: LOL. Again the “typical Hadi”. Yemen’s Deputy Minister of Human Rights Dr. Mohamed Askar accused Houthi and Saleh militias of looting food and medical aid provided by humanitarian organizations to those in need in areas under the control of the insurgents. The government also defended the legitimacy of its military operations carried out west of the country. Askar told Asharq Al-Awsat that reports issued by human rights organizations from Sana’a were not impartial as many looting cases were documented, the latest of which was in al-Bayda’ when Houthis looted trucks of food aid sent from the World Food Program and drug depots belonging to a number of international organizations. The Yemeni official said civilians living in areas controlled by Houthi militias are subjected to many human rights violations. They use civilians as human shields in conflict zones, and prevent women and children from fleeing to safer areas. Askar explained the reasons behind the lack of impartiality in international reports by saying that Houthi militias are not allowing the organizations to deliver real information in the reports sent to their headquarters around the world and are forcing them to manipulate the facts. On many occasions, local staff has played a negative role in many cases by issuing false reports by siding with the insurgents. My comment: LOL. See comment below. The Yemeni government on Friday said that the efforts exerted by the Yemeni Army to liberate the western coastal areas from rebel control are proof of the government’s keenness to save citizens from Houthi-Saleh militia attacks. “Citizens in the western coastal areas are suffering from ongoing violations and threats to human rights from the Houthi-Saleh rebels,” the statement said, adding that these include forced conscription of youth and children, detentions, kidnapping, bombing of civilian houses and denial of aid to citizens. The government stressed that the military advancements are strongly supported by the Arab coalition intent on having these areas liberated. The government also said that humanitarian assistance coming through Al-Hudeidah Port, especially petroleum products and food items, is often seized and sold by rebel leaders on the black market; the money they get is used to fund their military activities. As a result, the residents of Al-Hudeidah province continue to suffer from lack of food and basic necessities. The government also said it is working with the KSRelief and other humanitarian organizations to obtain necessary assistance for civilians. Work is also going on to revitalize important facilities in Al-Mokha and other cities located south of the Red Sea that were liberated. My comment: That again is quite odd propaganda. “Saving civilians from militia atrocities is our mission”: by bringing them a 23 month Saudi aerial bombing war?? “keenness to save citizens from Houthi-Saleh militia attacks”: the same; who is steadily attacking citizens in Northern Yemen? – ““military advancements are part of the government’s efforts to protect its citizens.”: That sounds Orwellian; the people of Mokha city fully could fruit of this type of “protection” within the last weeks. And, again, “protecting” them by bombing them for 23 month now, is a bloody folly and lie. Yes, there are human rights violations by Houthis; the very greatest part of killings, injuring, destructions, suffering is brought by Saudi coalition bombings however. Yes, a (smaller) part of humanitarian help is looted and resold on the Black Market – by Houthis as by others. But the bulk of humanitarian aid and all normal required imports for livelihood do not reach those who need it because of Saudi blockade; the Saudis having destroyed Hodeida harbour so that unloading ships got a problem: the Saudis having destroyed and destroying roads, bridges, trucks so that goods cannot be transported to the places where they are needed; by the Saudi blockade of Sanaa airport. – “working with the KSRelief”: the Saudis up to now have spent ca. US $ 140 billion for the aerial war against Yemen alone – and, compared to this, give some dates, some per mills of that sum for humanitarian aid, I would think the proper reason is a propaganda purpose. The US-Saudi agression fighter jets continued fierce strikes on several provinces over the past hours, targeting private and public properties, a military official told Saba on Saturday. The warplanes waged two strikes on al-Omeri Schools and area of Dhubab district and another one on Shabarah village in Mokha district of Taiz province, the official added. The Saudi aggression fighter jets on Saturday launched three strikes on Majz and Kutaf districts of Sa'ada province, a local official told Saba. The warplanes hit a communication network in Sawid area of Majz district, destroying it. And other strikes hit al-Aqiq and al-Atfain areas of Kutaf district two time, causing heavy damage to citizens' properties and farms, the official added. In Taiz: warplanes of the Saudi American aggression waged raid on Al Omari district. In Saada: warplanes of the Saudi American aggression waged raid on the communications network in Sweden region directorate of Majzzer. The Saudi aggression struck the house of Sheikh Mohammed al-Ghader in Khawlan district of Sana'a province, a local official told Saba on Saturday. The strike destroyed the house completely and cars in the house's yard. Comment by Soraya T: KSA is looking for more troubles in Yemen, this Sheikh was not with Houthies, & by striking his house #KSA pushes him & his tribe 4 revenge. The artillery and missile shelling have renewed between the Houthi-Saleh forces and the pro-government forces on Saturday in al Mocha district in western Taiz, southwestern Yemen, according to sources in the field. The sources told Almasdaronline that the shelling renewed after the Houthis and allied forces in Mawza area had launched 10 katyusha missiles on the pro-government forces sites southern al Mocha city. The pro-government forces air defense systems intercepted the katusha missiles, and shelled back the Houthis and allied forces sites in Mawza district and northern al Mocha city with missiles and heavy artillery. Meanwhile, the fighter jets of the Saudi-led Arab Coalition had launched three airstrikes on the Houthis and allied forces in al Mocha crossroad, central Mawza, and four raids on their sites in Yakhtel and al Wazieyah. The army and popular forces managed on Friday to secure Tabshe'a and al-Haram villages in al-Dhabab area in Taiz province. A military official told Saba that Saudi-paid mercenaries were inflicted heavy losses by the army and popular forces during the military clashes in the two villages. A man was killed in Saudi missile attack on houses and farms in Haydan district of Sa'ada province. Five citizens were wounded in the attack that targeted Tallan area on Saturday. Most of the border areas, including Tallan, which are struck by Saudi warplanes or/and artillery on a daily basis, are suffering a very difficult humanitarian situation, particularly for women and children. Films: Houthi / Saleh successes; dates of films? The missile force of the army and popular forces fired early on Sunday a medium-range ballistic missile on al-Shaqiq power plant in Jizan province, a military official said. The missile accurately hit the plant, which provides power to most of the military bases in Khamis Mushayt and Abha provinces. "The missile hit the target with high precision," the Arabic-language al-Massira television quoted a military source as saying. Al-Shaqiq power plant supplies electricity of most of Saudi Arabia's military bases. There were no immediate reports on the damages caused to the power plant, but the Yemeni missile attacks usually inflict heavy losses on the Saudi forces. Houthi/Saleh forces hitting back at Saudi water facilities? My comment: What actually has been targeted? Targeting civilian infrastructure is a war crime. New images of #Yemen army & militia break into & control the Saudi military site Asa'ad Al Majaz in the approved Asir KSA. These Photos Exist So People Won't Say "That Never Really Happened"
Fresh out of nursing school and just 22 years old, Alex Potter dreamed of being a photojournalist and bridging the gap between her home in the Midwest and the Middle East. After graduating from college, Potter left her native Minnesota and traveled to Jordan. When she saw that Yemen, a country on the Arabian Peninsula, had a big election coming up, she hopped on a plane in a matter of hours. Potter has been living in Yemen's capital, Sana'a, ever since. When Houthi rebels seized power in February and forced out the country's president, Abdrabbuh Mansour Hadi, Potter pointed her lens at the families around her as they struggled to cope. Airstrikes from neighboring Saudi Arabia, as well as the participation of fighters from Al Qaeda and the Islamic State group, or ISIS, have made the conflict a complex one. In March, ISIS carried out two major suicide bomb attacks at mosques in Sana'a, killing 137 people. Like racism and classism, sexism is against the interest of the students, if practiced in schools and colleges, consciously or unconsciously. The main reason for this inequality against females is not difficult to understand. Our society is traditionally a patriarchal one, grounded on three assumptions: that the separate spheres of men and women are natural divisions based on biology-as-destiny ideology; that women are defined in relation to men and children rather than as individual beings; and that women are inferior to men. Nature has decreed that women play caretaker roles such mother, wife and housekeeper. Those who venture outside home for work should occupy jobs such as nurses, teachers, caretakers and social workers, that are in line with these qualities. These roles are nothing but an extension of their domestic role as a support to men and their work. My comment: This article does not refer to Yemen in special but to patriarchal societies in general. The author seems to be Indian. The Yemen Times website presented it to Yemeni readers. "I used to be a doctor in Yemen"
Unlike most countries in the 1950s, which were to some extent developing, Yemen was still stuck in a darkness of ignorance and disease. Into this almost unheard of country came a French anthropologist and doctor, who fell in love with the country and its people. “I used to be a doctor in Yemen,” was written by Claudie Fayien and published in France in 1955. It was translated into Arabic by Muhsen Al-Eni in 1958, and released in Lebanon in 1960. Claudie Fayien worked in Yemen during the period from 1951 to 1952, and found a country living in the darkest of dark eras. The French doctor said that the world should know about Yemen. At that time only a few people in France had even heard of Yemen. Fayien came to Yemen during the rule of Imam Ahmad Hamid Al-Deen, a ruler who kept the north of Yemen away from any means of development. “I used to be a doctor in Yemen” is full of vivid descriptions about the humanitarian experience of the people in Yemen. This very detailed book has immortalized itself as one of the most important travel books of the region. Women received a considerable amount of attention in Fayien’s book, and she was deeply concerned how miserable their lives were in terms of education, health and their treatment from their husbands. For a proper Yemeni woman in that time, it was considered inappropriate for strangers to hear her voice. So when Fayien went to diagnose the medical condition of a woman, she had to talk to a translator, who in turn had to talk to the husband, who would then talk to his wife. Any replies from the wife in turn had to be relayed back through the husband, and the translator to Fayien.